As I’ve been writing this review, I’ve come to realize the lens through which I think it should be viewed – in relation to the backbone of the last codex, the Wave Serpent, and how it has changed. So let us consider the Wave Serpent’s new rules before delving deeper into the rest of the army in future posts. If you’re just joining us, Parts One and Two of my multi-part review of the Eldar Codex cover the aesthetics of the codex and the HQ choices respectively. I will begin by saying that, as an avid user of the Wave Serpent, there is no question in my mind that it was overpowered. There were games where the rest of my army hard already crumbled, and then slowly but surely the Wave Serpents would grind down the enemy, turing a rout into a remarkably close game. Altering that to tune it down would have taken a fairly subtle hand. There was a post I was working on before this Codex broke looking at ways to tone the Wave Serpent down. Of the list I had, Games Workshop basically said “We’ll take all of them”. So the changes…it got 5 points cheaper. It also lost a great deal. The Scatter Laser lost the Laser Lock ability army-wide, which means it’s no longer an extremely reliable way to make sure any other weapons on your Wave Serpent are twin-linked. But beyond that, the Serpent Shield was dramatically redesigned. Defensively, it still converts a penetrating hit to a glancing hit on a 2+. But offensively? It is now a 24″ range S6 Assault 2d6, Ignores Cover, One Use Only gun with Strikedown. For those of you who don’t remember what Strikedown does, a model that takes an unsaved wound or passes a save against this weapon moves as if it was in difficult terrain. More reliable perhaps than the old pinning, but also less useful. Finally, after the shield has been fired, it no longer operates defensively either. This is a huge number of changes. A massive reduction in range, going down to one shot only, and losing 1 Strength are the big ones. But how much does this matter? There’s a fair amount of simulation below looking at that question – if you’re interested in delving into the code, the iPython notebook is viewable here. The old Wave Serpent a pretty bimodal distribution. The “mean” result for the old Wave Serpent is actually less common than either more or less shots. The new one is much more normal. There is a much higher chance of a new Wave Serpent doing almost nothing. It’s still rare, but much less rare. Similarly, there is a long tail to the old Wave Serpent’s distribution – those glorious games where the Wave Serpents did work and absolutely hammered the enemy. 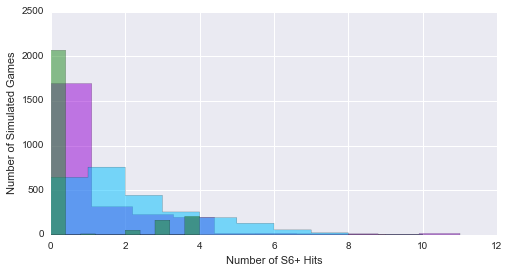 Those games were actually relatively common – 400+ simulated games had a Wave Serpent hitting ~ 22 times or more, and these kind of results are simply gone in the new version. 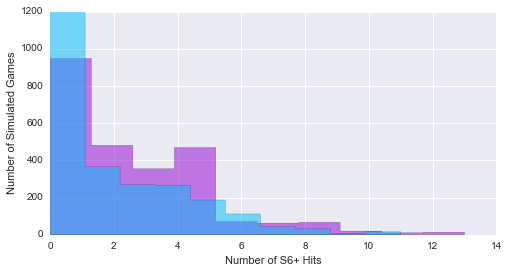 These results actually cloak how serious the change actually is – you have to keep in mind some of those purple shots are S7, not S6, which are vastly more effective at taking down AV12 vehicles, and infinitely more effective at taking down AV13 vehicles. Additionally, if our hypothetical Wave Serpent was also carrying a Shuriken Cannon, it is hitting less frequently as well – I didn’t model this, as it starts getting complicated and you start adding in more assumptions about how the tanks are moving, etc. Finally, this assumed both tanks were within 36″ for all four turns, and the new Wave Serpent was within 24″ for one of those turns. It’s possible, even likely, that an old-style Wave Serpent could have slipped in another shot or two at long range, making the distance between the two even greater. One of the other roles, beyond just “High Strength, Poor AP Gunboat” for the Wave Serpent, thanks to near ubiquitous twin-linking and the Serpent Shield ignoring cover (and thus jink) was as an ersatz AA platform. How well does the tank perform in this role? This figure shows the results of a single turn of shooting. As with the last figure, the purple is the old Wave Serpent, the blue is the new Wave Serpent (with the shield firing) and the green is the new Wave Serpent without the shield. The take-away? The 2d6 shots for the Serpent Shield well offsets the loss of the Laser Lock’s twin linking – it’s likely that you’ll get a couple hits in if you fire your shield at an aircraft, and there’s a slim but non-zero chance you’ll absolutely slam the aircraft – though the old-style Shield has a very long tail of nearly impossible but occasionally devastating volleys, I’d take a new Wave Serpent for a single shot, though the loss of S7 will make those hits less likely to penetrate. Without the shield however, the lone twin-linked Scatter Laser is predictably middling. This figure depicts a Wave Serpent acting as a dedicated, sustained AA platform, firing for two turns. Here, the loss of the Laser Lock and reliable Serpent Shield hits becomes more obvious – the new Wave Serpent simply hits less, though not so dramatically that if you were relying on your Serpents to keep the skies clear they’re now useless for that role. They’re simply slightly less good if their shields are down, or they’re being expected to provide sustained AA support. I’ll admit I’m a little disappointed that the defensive aspects of the Serpent Shield haven’t changed. One of the reasons the Serpent Shield was so easy to use as a gun was that there was rarely a reason not to shoot and give up the defensive bonus. The primary danger to Wave Serpents, in my experience, is not penetrating hits, but a volume of glancing hits. The Serpent Shield did very little to fix that, and the new version has the same problem – except it’ll be gone entirely after you fire it. Rather than making a reason to keep the shield, the reason you hold onto it is you only use it once. There’s also been an ambient decrease in the survivability of the Wave Serpent due to the changes in how holo fields work (5++ instead of +1 cover). I won’t belabor this, as I’ve talked about it here. The basic version? 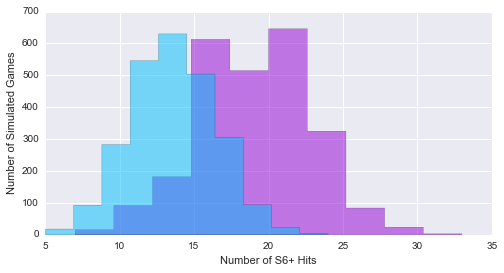 An ambient decrease in survivability, in exchange for being slightly more survivable against units that hunt Wave Serpents, like…well…Wave Serpents, or Tau with Ignores Cover or Sicarans. The changes to the Wave Serpent go beyond a nerf – a toning down of a unit to make it marginally less effective. Instead, I think it’s fair to say that the Wave Serpent has undergone a complete re-design. It is now very much a armed and survivable transport, but it’s definitely not a gunboat. So where does that leave us? Without widely available high Strength, Objective Secured gunboats, that volume of fire, that threat, has to come from somewhere else. Either more S6+ fire coming from elsewhere, or the army needs to be less about the transport and more about the units piling out of that transport. Turns out there are options for both. Is this leading up to a comparison of old wave serpents to new scatterlaser bikes? I’m personally convinced that the new scatterbikes are simply not as bad (/good, depending on perspective) as the old wave serpent was, point for point. Between not being a vehicle, not having native twin-linking, lack of ignores cover, and leadership concerns, they have a far less detrimental effect on the meta overall, in my opinion. I don’t think they’re the end of competitive gaming scene the way people are claiming, and I’d love to have someone better at math than I whose work I could point to when making that case. In some ways, yes it is – though looking at the new army as a whole, rather than just a side-by-side comparison. Interesting analysis. Honestly the unit needed a pretty complete re-design. The takeaway i’m missing is whether it is still a worthwhile unit, just not overshadowing all other eldar vehicles. I do think a redesign was warranted. As I said in the HQ section, whoever was writing this codex really likes the Eldar fluff, and the Wave Serpent now works much more like it should if you follow it’s fictitious role. Whether or not it’s a worthwhile unit will come up in the next couple parts of the review, because now as a transport it needs to be considered in the context of other units. But I thought with how much it had changed, it also merited some discussion all on its own. It’s in a bit of a tough spot too, as a transport, I think, since it has some very real competition from raiders in that regard.